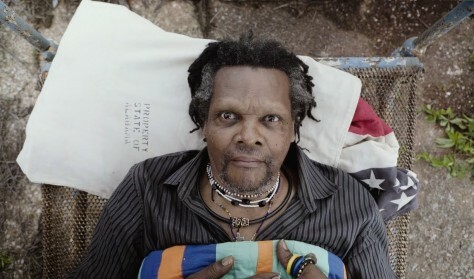 Lonnie Holley was born on February 10, 1950 in Birmingham, Alabama. From the age of five, Holley worked various jobs: picking up trash at a drive-in movie theatre, washing dishes, and cooking. He lived in a whiskey house, on the state fairgrounds, and in several foster homes. His early life was chaotic and Holley was never afforded the pleasure of a real childhood. Since 1979, Holley has devoted his life to the practice of improvisational creativity. His art and music, born out of struggle, hardship, but perhaps more importantly, out of furious curiosity and biological necessity, has manifested itself in drawing, painting, sculpture, photography, performance, and sound. Holley’s sculptures are constructed from found materials in the oldest tradition of African American sculpture. Objects, already imbued with cultural and artistic metaphor, are combined into narrative sculptures that commemorate places, people, and events. His work is now in collections of major museums throughout the country, on permanent display in the United Nations, and been displayed in the White House Rose Garden. In January of 2014, Holley completed a one-month artist-in-residence with the Robert Rauschenberg Foundation in Captiva Island, Florida, site of the acclaimed artist’s studio.